Now you can manage your ads from your Android, iPhone or iPad device. Wherever you are, whenever you need, the Bing Ads mobile app makes it easy for you to access and update your account on the go. Manage your campaigns when you're on the go. Why use the Bing Ads app? View performance data, edit budgets and change bids —  all while you’re away from your desktop. Manage multiple accounts and view your Account dashboard with the ease of a mobile app. View monthly spending and clicks, as well as get notifications when your credit card is about to expire. Call us whenever you need. Our support phone number is right at your fingertips. Check data on conversions, clicks, impressions, spend, click-through rates (CTR), average cost per click (Avg. CPC), average position, cost per acquisition (CPA), return on ad spend (ROAS) and conversion rate. Change campaign budgets within the ad app. Pause or enable campaigns, ad groups, ads, and keywords. Change ad group and keyword bids. View performance data on a graph by any time range for all account and campaign levels. See quick data visualisation of your impression share. Access your Quality Scores for campaigns, ad groups and ad grids. Use the Bing Ads app on any iOS or Android device, including tablets. Download Bing Ads for Android from Google Play or Bing Ads for iOS from the App Store. 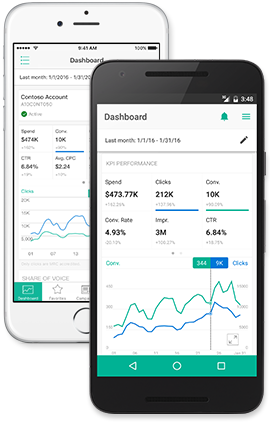 Then use the advertisement app to start managing your Bing Ads campaigns while you're on the go. Bing Ads for Android is available in English, French, German, Traditional Chinese, Spanish, Italian and Portuguese. Bing Ads for iOS is available in all Bing Ads markets globally for iOS 8.0 and later.